Big bag discharge stations are used for discharging big bags. The discharge systems are equipped with lifting gear and a big bag connection system with a press-on lid or inflatable collar. The new BATCHTAINER® und DOSITAINER® container generation with mobile scales or driverless transport systems allows the building of fully-automated container systems for contamination-free formula composition. Product feeders and rotary valves are examples of dosing systems that allow transfer and metering of bulk goods into pneumatic conveying systems. Fluid weighing systems with negative weighing technique are used for the precise weighing of high-viscosity liquids. Minor ingredient automation systems involves the fully-automated feeding of precisely-weighed small and minor quantities, ingredients and additives into the mixing process. Suction weighing systems are designed to transport bulk quantities to a predetermined location in the automatic production process and to weigh them precisely before they are transferred into mixing, homogenising and dispersing processes. Screening has now become inevitable as a result of the hazard analysis and critical control points (HACCP). 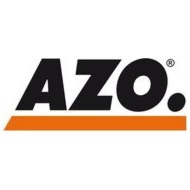 AZO supplies silos and hoppers for storing and discharge of bulk goods. We work with painted mild steel and different kinds of aluminium and chrome-nickel steel. Accessories such as filters, level measuring systems and discharge systems round off the product range.